I finally had enough. It feels like every summer I have to purchase or repair my lawn mower. I don’t mind fixing stuff and I know that wear and tear is normal but sometimes I just want to get the grass mowed. Because I live in the south, the land of endless sunshine, the grass grows like crazy during the summer months. I am terrified that my mower will break down again and I'll have a jungle outside which the neighbours may judge me for. I have managed to keep my gas powered mower working for the last three years. I don't know much about mower mechanics, but when it breaks I can usually figure out a way to fix it. It always seems that there is something to tweak or fix on it as the summers roll by. Back in February someone handed us a barely used mower. I was excited and ready for the summer to get here so I could use it. So I used it about four times and crap, wouldn’t you know it, the new one went out. It was used, but new enough not to have any problems. That's when I decided to do some research on those old reel mowers. I had seen them at a local home improvement store and thought they could be the answer to my problem. Originally I thought there is no way those things could cut grass. After I did some research on them, I found that they were actually quite good at cutting grass, but had a few drawbacks. When I talked to an older gentleman at the home improvement store, he mentioned using one as a kid all of the time. A few years a go he decided to buy one again. After trying it, his biggest complaint was constantly stopping to pull out twigs. Deciding it wasn't worth it he got rid of it. I took his insight and headed back to the research. After looking around, I remembered seeing an article by The Art of Manliness about a reel mower. 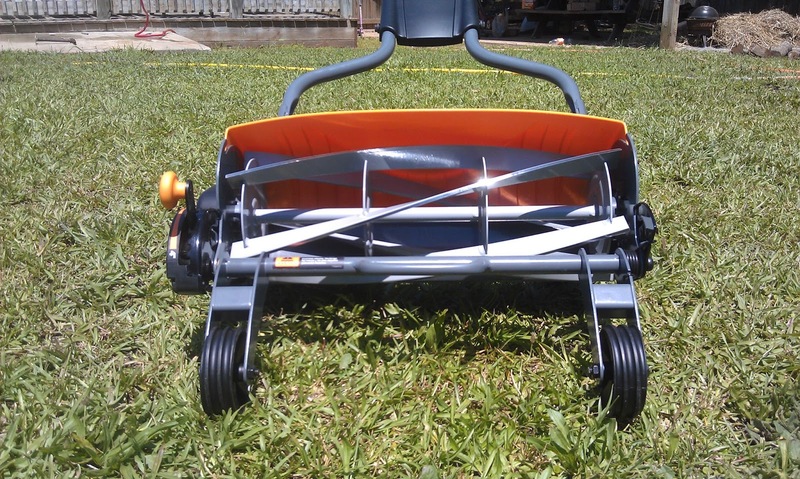 Brett McKay from The Art of Manliness suggested the Fiskars reel mower. After reading his review, I turned my research towards Fiskars. Right away I liked the idea of the Fiskars, but didn't want to pay $200. I had seen the older style ones for around $60-$70. Just like the guy at the home improvement store said old reel mowers were notorious for being held up by twigs and thicker grass. But Fiskars seemed to find a way to overcome those issues. I watched some reviews on Youtube where I could see the mower at work. After about the second or third video I was sold. Even though it was more in cost I knew it would be worth it in the long run. Fiskars took care of the grandpa problems of yesterday while still keeping the awesomeness factor. I also thought it was worth the extra money if I was going to give a non motorized mower a chance. After getting the mower and trying it out, I think it is awesome. 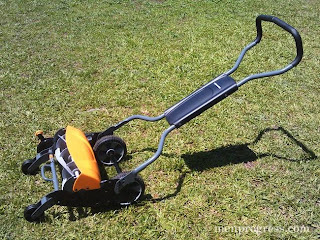 Here's my breakdown of why I decided to keep the Fiskars mower. The Fiskars Reel Mower does not require any maintenance. There are no filters or spark plugs to change. The Fiskars operates purely on push power and five rotating blades. The blades literally slice the grass like a pair of scissors. The older push mowers would require frequent sharpening of the blades, but the Fiskars stay sharp cutting system virtually eliminates friction and blade wear. I'm not a big environment guy but I like saving my money. The Fiskars does not require any gas. Gas powered mowers admittedly will not put you in the poor house, but five dollars here and there will eventually add up. It is nice not to drive to the gas station and fill up the gas can on a Saturday. FISKARS HAVE CORRECTED THE PROBLEMS OF THE OLDER ONES. ​Apparently the older ones had a rough time getting choked up with sticks and rocks. They would literally get stopped in their tracks. So far I have not had many crunches with sticks. Although I usually clean the lawn up a bit before I mow, only once did my mower get caught with a stick. But not to worry, it was actually my 9 year old little boy using it at the time and he didn’t have enough momentum to push through it. When I used it, the blades sliced through them no problem. With a little speed, the weight of the mower and the sharpness of the blades cut right through them. Most of the time the mower would actually just lay the twigs down flat so that the mower could pass over them. Fiskars boasts a special inertia drive technology which moves the blades fast and with a lot more power to blast through twigs and thick grass. So if it does encounter any resistance, it should power right through. It also has an adjustable height, unlike the older reel mowers. You can adjust the blades to cut the grass at a height from between one and four inches. If you miss a week or two of cutting, you can raise it up and start tackling taller grass. The Fiskars also edges better than its older counterpart. The blades are strategically placed in front of the back wheels so it goes right to the edge. The older ones had the blades between the wheels creating a boarder of 1-3 inches of uncut grass. It is estimated that their are 180,000 mower accidents every year with a traditional gas powered mower. On gas powered mowers, the blades can be very dangerous. The first kind of accidents occur when a person reaches for the blade to free debris (not smart). The second kind of accidents that occur are flying debris like rocks or sticks. The blades can travel at approximately 200 mph. If the motorized blade hits a rock, that rock then turns into a 200 mph projectile weapon. There is even a news story of a girl who was impaled in the neck while using a gas powered mower. Sometimes if you're busy enough you only have time to cut grass in the evening. With the Fiskars it is silent, no noise whatsoever. The only sound is the grass blades cutting like scissors. You can cut the grass at night or early morning whatever you want, but you don’t have to worry about waking the neighbors. No more cutting grass in 100 degree weather. While I'm sure Fiskars does not recommend children using it, I can say that I do let my little guy cut the grass with it. He started out using a motorized mower which I kept a real close eye on, but now he uses the Fiskars and I feel a whole lot easier about it. At the same time when I'm cutting grass, I don’t have to be concerned about my kids walking along side because there is not any flying debris. IT IS ENJOYABLE TO USE. The Fiskars is enjoyable to use. Cutting the grass is usually not much fun. I mean it’s fun in terms of satisfaction of a job well done, but cutting grass is usually an uncomfortable experience. With the Fiskars it is fun to use. When we got the thing, everyone in the house wanted to use it even my wife. IT DOES WELL ON HILLS. With most lawn mowers it can be hard to keep it on the hills. The Fiskars does not have a motor and is light enough to cling to a hill. If your yard is not grass, but weeds it might take a little more work. I have mainly grass, but a significant amount of that high weed stuff that shoots up. Although the machine has the power to cut, the weeds sometimes bounce around and miss the blades. For me it’s not a problem, it just takes a little more work. I had a friend who all they had were weeds In that case the Fiskars does require more work to get the job done. If you have nothing but weeds and are a “one cut pass guy” the Fiskars might frustrate you. All in all a great, very family friendly, alternative to the gas powered mower.